I am attempting to have tones played at the station. Currently we have the radio playing at the station fairly quietly. If one is working and not listening we may miss the tone and only find it via receiving an e-mail/SMS. I have setup a relay with a few alarms on it via an optoisolator relay board, that's working well (we have a simple bash script controlling the GPIO pins). My next step is to have the speakers connected to the output on the PI and turn the volume up and only play our departments tones and not the other dozen departments that shares the frequency. With this post I am attempting to include enough to be helpful thus it may be overly verbose. TwoToneDetect is working well for our department. We are running TwoToneDetect on a headless Raspberry PI 3. 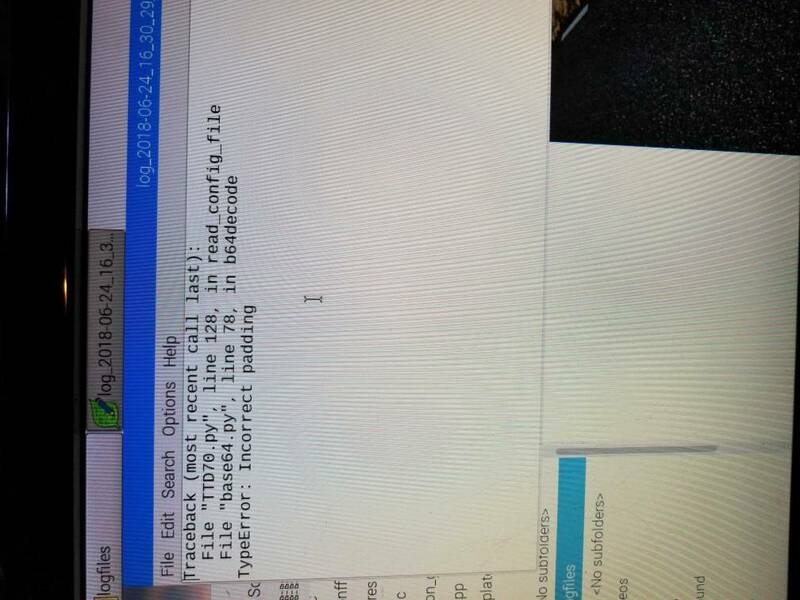 We are only running on version of TwoToneDetect and are not running anything else on the Raspberry PI that uses audio. everything other than the playback is working. (I have attmmpted this with alsa_output.platform-soc_audio.analog-stereo as a SINK with the same retuls). I have also attempted the sam with the PULSE_SOURCE and PULSE_SINK not set. tone_offset = 0.0 ;tone offset in percentage. .01 = +1% tone offset, -.02 = -2% tone offset, etc. Allong with it failing to create the .wav file audio never is played on the speakers. I'm trying to remember if I've ever gotten the playback_during_record to work on a Pi or not. The error you're getting is indicating that the system can't access the sound card. The Pyaudio library being used may not support simultaneous playback and record from the same device on a Pi. I would suggest trying to playback through the Pi's onboard audio output (rather than the USB sound card) and see if you can get that to work. Another more kludgy option would be to route the audio through a relay to the amplifier (assuming you're feeding an amplifier) that's controlled by a GPIO pin. I have attempted from the on-board audio too, without any luck. Currently the setup is just a bunch of the midland speakers kicking around the station with a 6 way headphones spliter (was setup before my time). As I am doing this on my own $ i am looking to see if someone will donate an old amplifier to the cause. I like the kludgy idea at least as a working proof of concept. I notice the message free notifications fire off as soon as the tone is received. Perhaps a script similar to how simple pushover fires could work along with that GPIO idea. I have some LEDs driven by TTD and node-red. I will see if they come on early enough to trigger such a speaker relay. One of many sources in this link if you can open it. Also I kind of recall DC31 saying he could listen to his incoming pages when I was trying to do that. However perhaps it was just the raw scanner feeds we send to broadcastify. Years ago, i remember having playback_during_record working on a pi. Probably an original Model B pi. In more recent attempts, I have not had success. You can use the alert_command to play a .wav file (alert tone?) which fires as soon as the tone set decodes. Then using the post_emsil_command you could play the recorded dispatch from the audio folder. However, this would delay the message until after recording is completed. Unless you can get the playback feature working, I think the speaker relay is probably the easiest, cheapest option. We have a pi connected up (HDMI) to a screen in the apparatus bay displaying IamResponding continuously. Any audio played on that pi comes right out of the tv speakers. If that works out well I might order a 2nd set and that should give me coverage in all of the bays and upstairs, with better volume only when we need it. The first set was ~$60 and should arrive Friday. I should be able to install them this weekend and give it a test. Thanks again for the the help. This software is very useful for our department. on the pi2. Now it’s being delayed 5 mins or more. Any ideas? I have been trying to get TTD to work on my new raspberrypi 3. The image from their website doesn't work on rpi3. I am trying to set this up without any GUI. On my older rpi2 I would get pulse as one of the input/output options. 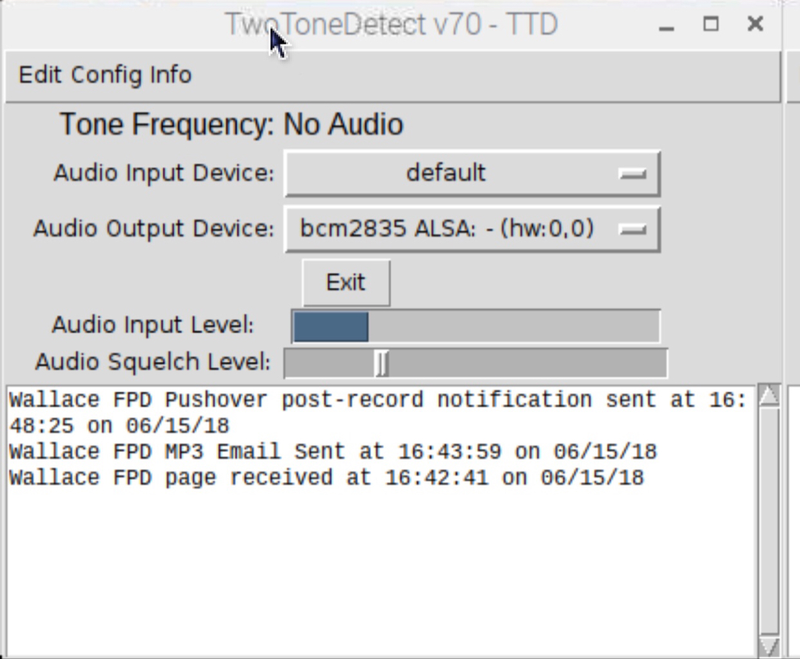 Anyone have a step by step to properly setting up pulseaudio on the rpi3 for use with TTD? Forget my prior post. I was using a modified version of 68 that I run. I upgraded to v70 and made the same modifications (removing all emailing/recording features) and it now works on the rpi3. Sorry, I should not hsve been so brief. If you are using TTD in the GUI mode, choose default as the input device in the TTD window. I did however get it working by upgrading to version 70 of TTD. Was using 68. Question what is different about command line environment that may impact startup via systemd?? I will share all this once it works!! If you have a v70 image, I would appreciate getting the link you have. If not, the v60 version still has all the functionality I need. What version of the pi are you running? An original model B, a pi2, or a pi3? If you have the original Model B and you are satisfied with it, you may want to stay there as it is pretty bulletproof. You can run the command line version of TTD70 on an old pi. Upgrading to the gui version will have performance issues on the old pi. It runs well on the pi2/3. I'm running a pi 3. I'd like to run the command line version and have it autostart, but what do you do about the stream of text that comes from that version. Do I log it, ignore it, ? Sorry I tried every option I could find and no luck. I want my RPi 3b+ to boot TTD 70 on boot but it wont work no matter what I try. I am completely new to this. I was able to get the program to execute a script that plays a station tone and activates a strobe in the bunkroom and play audio after the tone. . So I got frustrated and tried to download the TTD image from the website onto a brand new SD card I bought today and no matter what I do to the SD card (followed instructions from raspberry pi site) its just the rainbow screen.